Who doesn’t panic when hearing that a business meeting is due in a few hours and there are piles of files that need a resolution? Meetings may draw so many time management issues that you may miss out some critical updates due to your absence. While your company continues to operate and aims to improve, you might be searching for ways to protect your work while you attend the meetings. 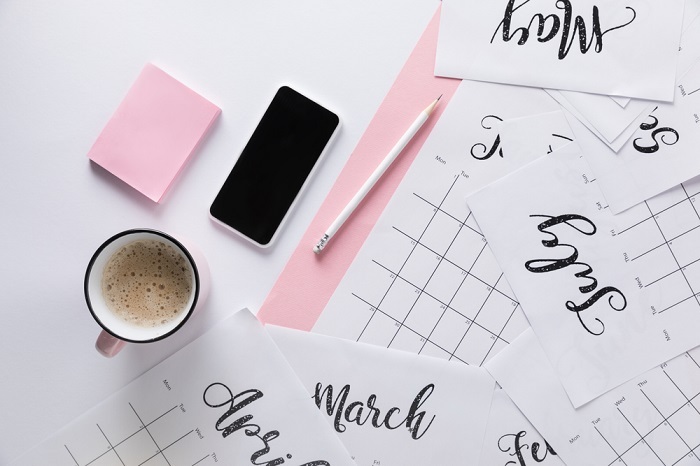 The printable calendar can be the hidden ace that can save your business meetings and keep you updated. Lost or duplicate appointments, corruption of meetings that are no longer visible or delegate issues – do any of these scenarios sound familiar? Aside from errors you might encounter, you might miss out on a meeting just because you fail to check your digital calendar or alarms. You can avoid such issues by turning into a reliable and resourceful tool – the printable calendar. Why Use a Printable Calendar? Paper calendars are easy to operate as they don’t involve a learning process. You can use the time you usually spend creating an account on a platform, finding a password and memorizing it to fill in data in the calendar. The paper tool doesn’t require a budget, as you can print out a sheet from an online platform. According to Calendar Table, you can choose between landscape or portrait options, or options which also include weekly planning. To make the topic clear, click here to find which options fit your needs. Reminders, if placed on a visible wall, next to your laptop or monitor. Information panels for your assistant, whenever a new business meeting appears. Time management optimizers, for scheduling administrative tasks. Evaluation tools, when you want to discover what errors you need to correct regarding the past month’s activities. Do Meetings Need to Be Saved? According to a study, meetings have increased in frequency and lengths over the past 50 years. Today, executives spend around 23 hours per week attending them – over 50% of their time. However, another study states that a company’s market share, employment stability, and innovative ideas are affected by dysfunctional meeting behaviors such as wandering off topic, criticizing and complaining. Official and scheduled meetings don’t include impromptu company gatherings or urgent appointments due to a crisis. Aside from these, there are also business lunches, meetings with prospects, pieces of training, workshops, conferences, press interviews and other such activities that require parts of your working time. Grab a printable calendar and a few colored pens. Set a tone for and symbol for each meeting you plan to include on the sheet. Then, eliminate. Set aside weekends, national holidays and family events or gatherings you need to attend. Also, exclude your vacation – if any. By leaving out unavailable time first, you can easier calculate how much you need to prepare for a meeting and avoid time pressure for specific tasks. Before scheduling conferences and activities, make sure you know exactly how long they take and if they involve post-activities such as compiling minutes and emails. There are two stages of filling in data into your calendar. Write meetings and tasks on a sheet of paper, then add them to your calendar. If you’re an executive who cannot schedule a meeting, then prioritize. Write down the most critical meetings into your calendar. Then, start adding necessary and recurrent weekly and monthly tasks. Research on reports, appraisals, updates for clients and so on. Only consider tasks that require four hours or above. The calendar doesn’t work as a to-do list, so feel free to leave out requirements you usually solve in little time. Also, avoid time pressure by including informal meetings that don’t make the digital schedule. You can find inspiration in some of the above examples. Some meetings require your attendance, while others don’t. Therefore, carefully consider those you need to attend, and that is of your professional interest. Routine gatherings you shouldn’t participate in might trigger a dysfunctional behavior. Delegate assistants and colleagues to attend meetings and notify them at least a day before the meeting. Your working time is as essential as meetings, while other colleagues might benefit from attending a conference on your behalf. Your printable calendar can only be beneficial if it also works as a reminder. Remember to consult and update the schedule every morning. If necessary, create a routine by checking your calendar even before reading your email. Routines help you stay up-to-date and get notified of any upcoming meetings and avoid the panic that the digital alarm creates when set on an hour before the meeting. Many business and company meetings require preparation, presentations, and reports. You will need time to compose and analyze them. Set prep time on your calendar, considering both data analysis and summary. You can even set a brief meeting that allows you to update colleagues with your conclusions if they’re also relevant to the preparation process of other departments. A printable calendar is a tool you can use in the long run. They can improve your time management skills and help you have an overview of your business activities. By placing a calendar on your office wall, you can also quickly confirm whether you’re available to meet a client. You can benefit from your calendar even if you’re away just by taking a picture of the current month’s notes. Moreover, since you cannot edit the calendar notes, you are also unable to postpone essential or urgent tasks. Your unique symbol and color code stops your assistant from adding data without your prior consent. However, you should provide them with access to your schedule. Using a printable calendar can save the efficiency of your business meetings and your working time. Use your calendar for at least three months and notice improvements!